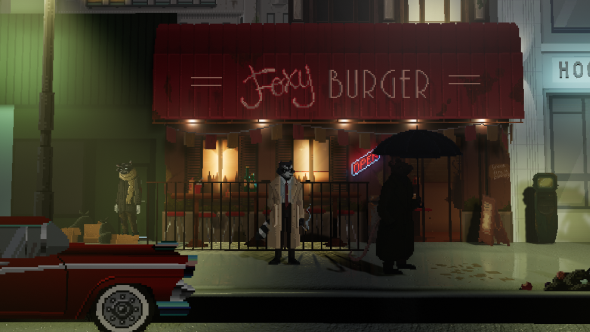 Backbone is a pixel-art adventure set in a dystopian Vancouver that stars a raccoon private investigator. 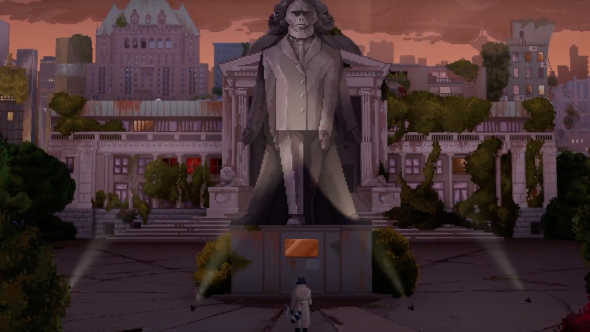 Taking social decay and discrimination as its themes, the game tells a story about how our environment shapes us, and how we shape it. On a literal level, it turns out developers EggNut are reshaping the environments in Backbone all the time while you play – invisibly and without you ever knowing. 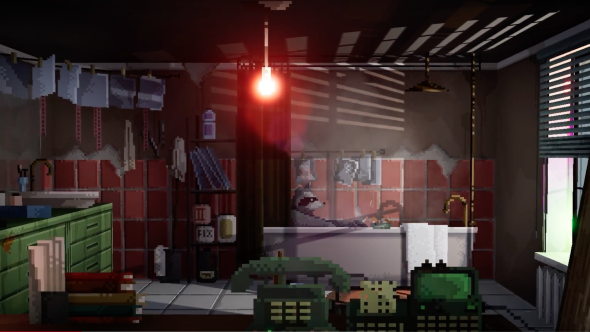 Backbone is a 2D game built in a 3D game engine. Thankfully, Unreal Engine 4 has a provision for that – a system called Paper 2D, which allows developers to create flat-looking games within its editor. 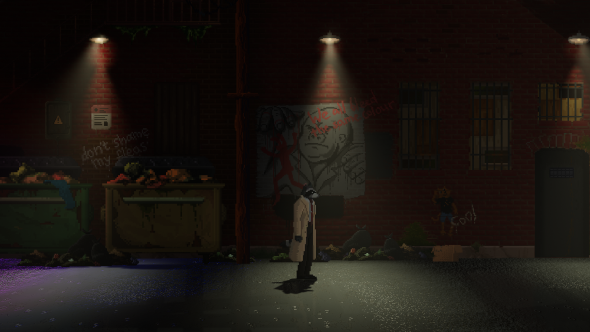 That’s perfect for Backbone, which functions largely like a traditional adventure game – with a slowly side-scrolling single plane. However, Backbone also has a climbing mechanic. By clambering onto objects within reach, you can walk the top of Vancouver’s buildings and continue your investigation from up there. In other words, although all of the places and people in Backbone’s world appear in 2D, they exist at varying distances from the camera. There’s a good reason for this: in an adventure game, you rarely want to collide with the objects and characters in an environment; instead you glide past them, until such time as you choose to interact. Climbing is the one instance in which that system doesn’t help. You might want to hop from one low roof to another, but in-engine, your racoon and those two buildings all exist on different planes. To make it work, the game runs a trace – a way of reaching into the level and getting feedback on what’s happening – and then temporarily reshuffles the objects to suit. “The character needs to move forward or backwards depending on where the object is located to climb on it,” Danshin explains. “Then, when you go back onto the street, that should also be calculated to bring you back to your original location, and not fall down through the textures into the abyss. None of this trickery will be apparent in the finished game, of course – the fact that you’re warping back and forward in space will stay between us, the developers, and the racoon detective. Oddly enough, one of Backbone’s other tricks is to make the invisible seen. In anthropomorphic Vancouver, scent is just as important as sight. Characters and some objects leave trails, allowing you to track suspects, or for them to track you. Occasional stealth sections require you to mask your smell with a change of clothes or a quick bath in the garbage bins. Trails appear as glowing, floating specks in the world – a neat shorthand for the olfactory advantage our protagonist has. Every source of smell has a different colour and intensity of particle, via a system that spawns particle emitters. Various objects can interact with that particle system, sending information back and forth so that one scent can cover another. It’s a clever solution, but it’s led to a unique problem for the team. 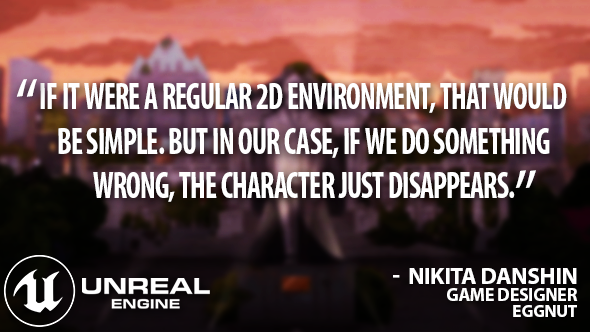 Most developers don’t need to worry about what happens to particle effects when they’re not firing – they’re decorative only. But, for EggNut, they’re the foundation of a persistent smell-based stealth system. These are the peculiar demands of the raccoon detective adventure genre. It’s a field that EggNut’s team of six, from Russia, Siberia, and Vancouver, seem to have willed into being through sheer, shared determination. Backbone is on Kickstarter, with a planned release in 2019. Unreal Engine 4 is now free. In this sponsored series, we’re looking at how game developers are taking advantage of Unreal Engine 4 to create a new generation of PC games. With thanks to Epic Games and EggNut.